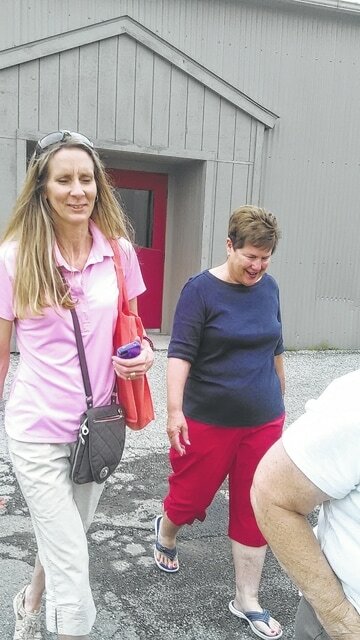 Trish Ratliff, left, recently took over the position as director of the Bucyrus Tourism and Visitors Bureau. BUCYRUS – The face of the Bucyrus Tourism and Visitors Bureau is a new one. Trish Ratliff took over the position recently after Barb Glowaski left to become the director of the United Way of Crawford County. “It’s a fun job and I love working with people to promote the community,” said Ratliff while touring Cooper’s Mill with tourists in town for the annual Crawford Antique Farm Show. Ratliff, who is a native of Virginia but came to Bucyrus with her husband, city law director and prosecutor Rob Ratliff from Alabama, lives in Crestline. She is mom to one son. “There is a push to expand the bureau county-wide which I am invested in. There are so many interesting people and places to visit throughout the county and we need to promote that,” Ratliff said. Currently, the tourism bureau offers tours of key places in Bucyrus, such as the murals, Cooper’s Mill and Carle’s, along with hot spots in New Washington, Galion, Crestline and rural areas. Ratliff has a doctorate in health and wellness from the Rocky Mountain University of Health Professions. “I also have a master’s degree in exercise physiology from the University of South Alabama,” said Ratliff who earned her bachelor’s from James Madison University in Virginia. Ratliff said the bureau receives about $25,000 per year from the city’s bed tax from local hotels and motels. “We get 50 percent of the bed tax and the city keeps the other half,” Ratliff said. Ratliff said the bureau takes in about $10,000 per year from membership fees. “Members of the bureau have a lot of benefits including the annual brochure we put out across the state. Basically, businesses are able to advertise all year round. It’s a great deal for them and we also refer people to those businesses when they are in the area,” Ratliff said. Ratliff said she is excited about her new position. “I really enjoy promoting our area. We have so much to offer,” Ratliff said. For more information, visit http://www.visitbucyrus.com or call 419-562-0720.